his is how Danish chef Morten Bojstrup Nielsen is pleasing—and surprising—commensals as Dusit Thani Bangkok’s new Group Chef of Thai Cuisine. 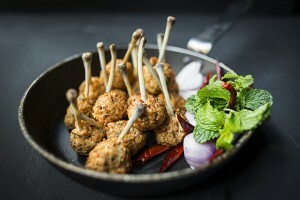 Foreign chefs successfully cooking Thai cuisine have ruffled the feathers of some Thai traditionalists, but Thai cooking is not a geographically protected food style, so it’s fair game, especially considering the results these chefs are achieving. Now a rebel has turned up in the Heritage House of Dusit Thani Bangkok (946 Rama IV Rd, Bangkok, 02 200 9999 ext 2699) with the appointment of new Group Chef of Thai Cuisine, Morten Bojstrup Nielsen. His mission is to change without changing, to revamp the Benjarong brand with its deep, classic roots, and give it a flourish that marries the best of Thai cuisine with New World innovation. The award-winning Danish chef, who worked at David Thompson’s Nahm and at Sra Bua by Kiin Kiin in Bangkok, specializes in combining modern techniques with traditional flavor profiles to produce contemporary dishes that are distinctly Thai at heart. Based in the flagship Benjarong branch at the Dusit Thani Bangkok, he oversees the kitchen, the group’s global Thai taste headquarters to develop the next generation of Dusit Thai’s global culinary talent. The culinary journey begins with deep-fried tom yam flavored taro chips, which make a perfect bar snack to accompany the restaurant’s signature Margarita Thai cocktail. Scallop and papaya with lemongrass and coconut milk had intriguing layers of taste. The dish also incorporated diced slow-cooked chicken, with tongue-tingling smoked chilli tomato jam and crispy skin. The next course came in two components. Soup river prawns, shimeji mushrooms and coriander were sitting in the bowl, and the perfectly extracted hot and sour soup was poured on top from individual jugs. The second element was a deconstructed yam pla duk foo, a crispy fish and green mango salad; to keep the crispness of the catfish it’s presented in a clear glass cone that sits on the tom yam custard with crab meat. 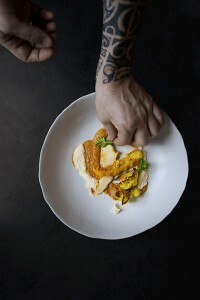 Once on the table, the crispy catfish is shaken on the custard—it’s a dish best eaten by driving the spoon to the bottom of the bowl and scooping upward to get all the complex flavor. Non-traditional seared foie gras acquires a Thai accent when dressed in a pineapple, tamarind, and fresh ginger sauce. Nielsen serves his gung satay off the stick: river prawn with peanut sauce, satay spices, and cauliflower purée. He slow-cooks a succulent beef rib on bone and serves it with an aromatic green curry gravy, for contemporary plating with an authentic taste. Dinner concludes with basil ice cream and a perfectly ripe fresh pineapple. The rebel with a cause: the global evolution of Thai cuisine.